Klay Thompson lights it up for 27 points in the first half to lead the Warriors past the Clippers in Game 4. Check out the Top 5 plays on this playoff Thursday in the NBA. •Selected by Golden State as an early entry candidate in the first round (11th overall) of the 2011 NBA Draft. •Signed a contract extension with Golden State on October 31, 2014. •Named to the All-NBA Third Team in back-to-back seasons (2014-15 and 2015-16). •Earned First Team All-Rookie Honors in 2011-12. •Three-time All Star (2015, 2016, 2017), starting in the backcourt alongside teammate Stephen Curry in 2015. •Holds the NBA record for most points scored in a quarter and most three-pointers made in a quarter, tallying 37 points in the third frame on a perfect 9-of-9 from three-point range on 1/23/15 vs. Sacramento. •Owns two of the top 10 single season three point totals in NBA history: (4) 276 in 2015-16, (7) 268 in 2016-17. •Joined Stephen Curry as the only players in NBA history to hit at least 200 three-pointers in five consecutive seasons (2012-13 to 2016-17). •Has connected on 1,328 three-pointers in his first six NBA seasons, an NBA record for the most threes ever by a player in his first six seasons in the league. •Combined with his backcourt mate, Stephen Curry, to hit 678 three-pointers in 2015-16, the most by a tandem in a single season in NBA history. •Has increased his scoring average in each season... Is the first player since Moses Malone from 1976-77 to 1981-82 to increase his scoring average for his first six years in the NBA after averaging at least 10 points as a rookie. •Became the fourth player in Warriors history to score 60 points in a game, joining Wilt Chamberlain, Rick Barry and Joe Fulks... Scored 60 points in 29 minutes on 12/5/16 vs. Indiana, becoming the first player in the Shot Clock Era (since 1954-55) to score 60 points in a game with fewer than 30 minutes played, per the Elias Sports Bureau. •Won the Three-Point Contest at 2016 NBA All-Star Saturday Night, tying Stephen Curry’s Three-Point Contest record (set in 2015) with a score of 27 points in the final round. •Won an Olympic gold medal with Team USA at the 2016 Olympic Games in Rio de Janeiro... Won gold with Team USA at the 2014 FIBA Basketball World Cup in Spain. •Named Western Conference Player of the Week four times. •On the Warriors’ all-time regular-season career leaders lists, ranks second in three-pointers made (1,328), third in three-point percentage (.419) and fourth in free throw percentage (.853). •Appeared in 464 games (427 starts) over six seasons with Golden State, averaging 19.1 points, 3.3 rebounds and 2.3 assists in 32.7 minutes while shooting 45.3 percent from the field, 41.9 percent from three-point range and 85.3 percent from the free throw line. •Appeared in 81 postseason games (all starts), averaging 18.8 points, 3.9 rebounds and 2.3 assists in 36.5 minutes while shooting 43.2 percent from the field, 40.4 percent from three-point range and 82.4 percent from the free throw line. •On the Warriors’ all-time postseason career leaders lists, ranks first in minutes played (2,958), first in games played (81), second in three-pointers made (237), third in points (1,525), third in field goals made (560), fifth in steals (75), fifth in blocks (45), sixth in three-point percentage (.404), eighth in free throws made (168), eighth in assists (190) and 10th in free throw percentage (.824). •On the NBA’s all-time postseason career leaders lists, ranks 12th in three-pointers made (237). •Has scored 20-plus points 37 times, 30-plus nine times and 40-plus once in his postseason career. •Has recorded one double-double in his postseason career (one 30/10 game). •Owns the NBA record for most threes made in a postseason game (11 three-pointers in Game 6 of the 2016 Western Conference Finals on 5/28/16 at Oklahoma City) and the NBA record for most threes made in a five-game series (28 vs. Portland, 2016 Western Conference Semifinals). •Finished the 2016 NBA Playoffs with 98 three-pointers (98-of-231 3FG), tying Stephen Curry’s record for most threes made in a single postseason set in 2015. •Connected on at least one three-pointer in 31-straight postseason games, a career-best playoff three-point streak (dating back to the 2013 Playoffs, 5/16/13-4/18/16). •Scored 37 points, including 26 in the first half, in Game 5 of the 2016 NBA Finals on 6/13/16 vs. Cleveland, his career Finals scoring high. •Finished the 2016 Western Conference Finals with 30 three-pointers (30-of-72 3FG), which is second-most in a series in NBA history (behind Stephen Curry’s 32 threes in the 2016 NBA Finals and 2016 Western Conference Finals). •Hit an NBA playoff record 11 three-pointers (11-of-18 3FG) in Game 6 of the 2016 Western Conference Finals on 5/28/16 at Oklahoma City, scoring a postseason career-high 41 points... Tied a playoff career-high with 14 field goals in that contest. •Swiped a playoff career-high-tying three steals in Game 4 of the 2016 Western Conference Finals on 5/24/16 at Oklahoma City... Scored 19-straight Warriors points in the third quarter of that contest. •Scored 20-plus points in eight-straight games (4/24-5/16/16), a playoff career-best streak. •Hit at least five threes in seven-straight games (4/24-5/11/16), an NBA playoff record streak. •Became the first player in NBA history to hit seven threes in consecutive playoff games, doing so in three-straight (4/24-5/1/16)... Hit 21-of-36 (.583) from three-point range over that stretch, the most threes over a three-game period in NBA postseason history. •Hit a career-high 15 free throws (15-of-16 FT) en route to scoring 34 points in Game 2 of the 2016 First Round on 4/18/16 vs. Houston. •Connected on his 100th career postseason three-pointer in Game 1 of the 2016 First Round on 4/16/16 vs. Houston. •Hit a playoff career-high 14 field goals en route to scoring 34 points in Game 2 of the 2015 NBA Finals on 6/7/15 vs. Cleveland... Became the first Warrior since Rick Barry in 1975 to score at least 30 points in an NBA Finals game. •Became the 12th player in franchise history to tally 500 points for his postseason career in Game 6 of the 2015 Western Conference Semifinals on 5/15/15 at Memphis. •Scored 20-plus points in four-straight postseason games (every game of the 2015 First Round against New Orleans, 4/18-4/25). •Dished out a playoff career-high seven assists in Game 7 of the 2014 First Round on 5/3/14 at the L.A. Clippers. •Led the team in three-point field goal percentage during the 2013 NBA Playoffs, hitting 42.4 percent from distance (25-of-59 3FG). •Logged a postseason career-high 51 minutes in Game 4 of the 2013 Western Conference Semifinals on 5/12/13 vs. San Antonio, finishing with 10 points and a playoff career-high-tying three steals. •Tallied 34 points, his first career 30-point postseason game, and grabbed a postseason career-high 14 rebounds in Game 2 of the 2013 Western Conference Semifinals on 5/8/13 at San Antonio, joining Michael Jordan, Kobe Bryant and Vince Carter as the only guards to reach those point/rebound figures in a game in the last 25 years... Marked the first double-double (first 30/10 game) of his postseason career. •Made his NBA Playoff debut in Game 1 of the 2013 First Round on 4/20/13 at Denver, scoring 22 points and grabbing three rebounds in 41 minutes. •Appeared in 78 games (all starts), averaging a career-high 22.3 points, 3.7 rebounds and 2.1 assists in 34.0 minutes while shooting 46.8 percent from the field, 41.4 percent from three-point range and 85.3 percent from the free throw line. •Connected on 268 three-pointers, which ranks seventh on the NBA’s single-season three-pointers made list... Joined teammate Stephen Curry as the only players in NBA history to hit at least 200 three-pointers in five consecutive seasons. •Among league leaders, finished the season ranked second in three-pointers made (268) and tied for ninth in three-point field goal percentage. •Has hit at least one three-pointer in a career-best 54 consecutive games (12/11/16-4/12/17). •Tallied 50 20-point games, nine 30-point games, two 40-point games, one 50-point game and one 60-point game. •Led the NBA in catch and shoot points (11.5), the third time he led the NBA in catch and shoot points (10.3 in 2015-16; 9.1 in 2013-14). •Named a reserve on the 2017 Western Conference All-Star Team, earning his third career All-Star selection. •Competed in the Three-Point Contest at 2017 NBA All-Star Saturday Night, where he was narrowly edged out in the first round. •Scored 41 points (23 in the first half) on 4/4 vs. Minnesota, recording his second 40-point game of the season… Coupled with Stephen Curry’s 42 points in Golden State’s previous game on 4/2 vs. Washington, marked the first time in more than 43 years that two different Warriors scored at least 40 points in back-to-back games in the same season (last: Cazzie Russell with 46 points on 3/24/74; Rick Barry with a career-high 64 points on 3/26/74), per the Elias Sports Bureau. •Scored 31 points, his eighth 30-point game of the season, on 7-of-11 (.636) from three-point range on 3/26 vs. Memphis. •Recorded his seventh 30-point game of the season on 3/20 at Oklahoma City, finishing with 34 points on 7-of-15 (.467) from three-point range... Marked the third time in their careers (second of the season) that he and backcourt mate Stephen Curry both hit at least seven threes in the same game (no other duo had done so more than once). •Scored 21 of his 29 points in the first quarter, a first quarter season-high and his third 20-point quarter of the season, on 3/16 vs. Orlando. •Finished with 30 points, his sixth 30-point effort of the season, on 3/10 at Minnesota. •Crossed the 1,000 assist threshold for his career on 2/25 vs. Brooklyn. •Scored 20-plus points in eight-straight games (1/29-2/15), matching a career-best streak. •Tallied his fifth 30-point game of the season with 35 points on 2/15 vs. Sacramento... Recorded his 400th career steal in that contest... Marked his eighth-straight 20-point game, matching a career-best streak. •Hit a season-high-tying eight threes on 2/10 at Memphis, finishing with 36 points. •Celebrated his 27th birthday by making his 400th career regular-season start on 2/8 vs. Chicago, tallying 28 points. •Dished out a career-high-tying eight assists on 2/1 vs. Charlotte, finishing the game with 29 points, including 26 in the first half. •Connected on 13-of-15 from the free throw line, both regular-season career-highs, on 1/29 at Portland. •Hit his 1,200th career three-pointer on 1/28 vs. the L.A. Clippers. •Scored all 21 of his points on threes on 1/22 at Orlando, becoming the first Warriors player to score 21 points on only three-pointers... Marked the second time in their careers that he and backcourt mate Stephen Curry both hit at least seven threes in the same game, just the seventh time in NBA history that teammates have both hit at least seven threes in the same game... Became the only duo to accomplish this feat multiple times. •Tallied 24 points on 12/25 at Cleveland, the most he has ever scored in a game on Christmas in his career (previous: 23 vs. L.A. Clippers, 2013)... Connected on 5-of-11 (.455) from three-point range, tied for the second-most threes made in a game on Christmas Day (most: six, Ryan Anderson, 2011). •Swiped a season-high four steals on 12/22 at Brooklyn, scoring 23 points and grabbing five rebounds in 35 minutes. •Scored a career-high 60 points on 12/5 vs. Indiana, joining Wilt Chamberlain, Rick Barry and Joe Fulks as the only Warriors to reach the 60-point mark in a game... Scored 60 points in 29 minutes, becoming the first player in the Shot Clock Era (since 1954-55) to score 60 points in a game with fewer than 30 minutes played, per the Elias Sports Bureau... Became the first Warrior in nearly 43 years to score 60 points in a game (last: Rick Barry, career-high 64 vs. Portland, 3/26/74)... Connected on a career-high 21 field goals, shooting 21-of-33 (.636) from the field, 8-of-14 (.571) from three-point range and 10-of-11 (.909) from the free throw line… Scored 40 points in the first half, a career-high for scoring in a half and the most in any half in the NBA since Jimmy Butler scored 40 points in the second half on 1/3/16... Became the seventh Warrior in franchise history to record multiple 50-point games for his career (Wilt Chamberlain, Rick Barry, Stephen Curry, Purvis Short, Antawn Jamison, Phil Smith). •Appeared in his 400th career regular-season game on 11/21 at Indiana, scoring 25 points. •Recorded his first 30-point game of the season with 30 points on 11-of-18 (.611) from the field on 11/13 vs. Phoenix. •Missed three games due to rest (1/10, 3/11, 4/10)... Missed one game with a sore right arch (2/13). •Appeared in 17 games (all starts), averaging 15.0 points, 3.9 rebounds and 2.1 assists in 35.1 minutes. •Scored 20-plus points four times and 30-plus once. •Scored a 2017 postseason-high 30 points (ninth career 30-point postseason game) to go with six rebounds and two assists in a 2017 postseason-high-tying 41 minutes in Game 3 of the NBA Finals on 6/7 at Cleveland... Scored 16 points in the first quarter, a 2017 postseason-high for scoring in any quarter, and 21 points in the first half, a 2017 postseason-high for scoring in any half... Connected on six three-pointers in that contest (6-of-11 3FG), a 2017 postseason-high... Scored at least 20 points in back-to-back games for the first time in the 2017 postseason. •Scored 22 points, recording his third 20-point game of the 2017 postseason, and grabbed a 2017 postseason-high seven rebounds in Game 2 of the NBA Finals on 6/4 vs. Cleveland... Appeared in his 78th career postseason game, passing Jeff Mullins (77) for the most postseason games played in franchise history. •Finished with 10 points in 34 minutes in Game 4 of the Western Conference Finals on 5/22 at San Antonio. •Tallied 17 points and six rebounds in 36 minutes in Game 3 of the Western Conference Finals on 5/20 at San Antonio. •Tied a playoff career-high with three steals in Game 1 of the Western Conference Finals on 5/14 vs. San Antonio. •Scored 21 points, his second 20-point game of the 2017 postseason, in Game 4 of the Western Conference Semifinals on 5/8 at Utah. •Became the franchise’s all-time postseason minutes leader in Game 3 of the Western Conference Semifinals on 5/6 at Utah, passing Rick Barry (2,579) for the top spot. •Moved into second place on the franchise’s all-time postseason games played list in his 67th career playoff game in Game 3 of the First Round on 4/22 at Portland... Scored 24 points, including 14 in the third quarter, and matched a postseason career-high with three steals in that contest. •Hit three three-pointers in Game 2 of the First Round on 4/19 vs. Portland, becoming the 16th player in NBA history to reach the 200 three-point threshold for his postseason career. •Appeared in 80 games (all starts), averaging career-highs of 22.1 points and 3.8 rebounds to go with 2.1 assists in 33.3 minutes, shooting a career-best 47.0 percent from the field, 42.5 percent from three-point range and 87.3 percent from the free throw line. •Earned All-NBA Third Team honors for the second consecutive season. •Among NBA leaders, ranked tied for fifth in three-point percentage and 12th in scoring. •Connected on 276 three-pointers, the third-highest three-point total in a single season in NBA history (behind two Stephen Curry seasons). •Joined Stephen Curry as the only players in NBA history to hit at least 200 three-pointers in four consecutive seasons. •Combined with his backcourt mate, Stephen Curry, to hit 678 three-pointers, the most by a tandem in a single season in NBA history. •Scored 20-plus points 42 times, 30-plus 17 times and 40-plus four times. •Hit his 76th three-pointer of the month of March on 3/29 vs. Washington, breaking Stephen Curry’s record for most threes in the month of March... Finished March with 79 threes. •Named Western Conference Player of the Week for games played 3/21-3/27 after averaging 32.3 points on 51.7 percent shooting from the field and 62.2 percent from three-point range (28-of-45 3FG), his first weekly award of the season (fourth career). •Scored 40 points in back-to-back games for the first time in his career, tallying 40 points on 3/25 vs. Dallas and 40 points on 3/27 vs. Philadelphia... Averaged 53.3 percent shooting from three-point range over those two contests. •Became the second fastest player in NBA history to reach 1,000 career three-pointers on 3/18 at Dallas, doing so in his 372nd game, which is second only to teammate Stephen Curry, who accomplished the feat in his 369th game... Recorded his third career game with double-digit three-pointers, connecting on 10-of-15 (.667) from distance to finish with 39 points. •Appeared in his second-straight All-Star Game, tallying nine points, two rebounds, two assists and one steal in 21 minutes... Joined Stephen Curry and Draymond Green to give the Warriors three players in the All-Star Game for the first time since 1976, when Rick Barry, Phil Smith and Jamaal Wilkes all represented Golden State at the league’s annual showcase. •Won the Three-Point Contest at All-Star Saturday Night, tying Stephen Curry’s Three-Point Contest record with a score of 27 points in the final round... Hit his final eight three-pointers, including six-straight money balls... Along with Curry’s victory in 2015, Golden State became the first team in the history of the Three-Point Contest (since 1986) to have two different players win the event in consecutive years. •Swiped a season-high five steals on 2/10 at Phoenix. •Scored a season-high 45 points on 1/27 vs. Dallas, including 26 points in the first half, to record his second 40-point game of the season... Shot a perfect 10-of-10 from the free throw line, tying a career-high for free throws made and tying the most free throws he has hit without a miss in a game in his career. •Tied a career-high with 16 made field goals (16-of-27 FG) on 12/31 at Houston, finishing with 38 points. •Scored 43 points, his first 40-point game of the season, on 12/16 vs. Phoenix, hitting 15 field goals (15-of-22 FG). •Scored 39 points (29 in the first half) on 12/8 at Indiana, hitting 10-of-16 from long distance to join J.R. Smith and Stephen Curry as the only players in NBA history to post multiple career games with at least 10 three-pointers. •Dished out a season-high seven assists on 11/22 at Denver. •Tied a career-high with 10 free throws on 11/19 at the L.A. Clippers. •Missed one game with a sprained right ankle and one game due to back stiffness. •Appeared in 24 postseason games (all starts), averaging playoff career-highs of 24.3 points and 1.08 steals to go with 3.7 rebounds and 2.3 assists in 35.4 minutes, shooting 44.4 percent from the field, 42.4 percent from three-point range and 85.4 percent from the free throw line. •Scored 20-plus points 16 times, 30-plus six times and 40-plus once. •Finished the 2016 playoffs with 98 three-pointers (98-of-231 3FG), tying Stephen Curry’s record for most threes made in a single postseason set in 2015. •Scored 37 points, including 26 in the first half, in Game 5 of the NBA Finals on 6/13 vs. Cleveland, his career Finals scoring high. •Hit an NBA playoff record 11 three-pointers (11-of-18 3FG) in Game 6 of the Western Conference Finals on 5/28 at Oklahoma City, scoring a postseason career-high 41 points... Tied a playoff career-high with 14 field goals in that contest. •Swiped a playoff career-high-tying three steals in Game 4 of the Western Conference Finals on 5/24 at Oklahoma City... Scored 19-straight Warriors points in the third quarter of that contest. •Scored 20-plus points in eight-straight games (4/24-5/16), a playoff career-best streak. •Hit at least five threes in seven-straight games (4/24-5/11), an NBA playoff record streak. •In the Western Conference Semifinals vs. Portland, averaged 31.0 points while hitting 49.5 percent from the field and 50.0 percent from three. •Connected on 28 three-pointers in the Western Conference Semifinals (28-of-56 3FG), an NBA record for most three-pointers made in a five-game series. •Became the first player in NBA history to hit seven threes in consecutive playoff games, doing so in three-straight (4/24-5/1)... Hit 21-of-36 (.583) from three-point range over that stretch, the most threes over a three-game period in NBA postseason history. •Hit a career-high 15 free throws (15-of-16 FT) en route to scoring 34 points in Game 2 of the First Round on 4/18 vs. Houston. •Tallied his 100th career postseason three-pointer in Game 1 of the First Round on 4/16 vs. Houston. •Appeared in 77 games (all starts), averaging 21.7 points and 3.2 rebounds to go with career-highs of 2.9 assists and 1.13 steals in 31.9 minutes, shooting career-high marks of 43.9 percent from three-point range and 87.9 percent from the free throw line. •Named to the All-NBA Third Team, his first career All-NBA honor... Joined on the All-NBA Team by backcourt mate Stephen Curry (First Team), making the pair the first backcourt duo to receive All-NBA honors since Seattle’s Gus Williams and Dennis Johnson both made the Second Team in 1979-80. •Among NBA leaders, ranked third in the NBA in plus/minus (+10.1), fourth in three-point percentage, fourth in Net Rating (15.8) and tied for ninth in scoring. •Tallied 46 20-point games, eight 30-point games, four 40-point games and one 50-point game. •Tallied 42 points on 15-of-20 (.750) shooting from the field (including 8-of-10 3FG) on 4/13 vs. Memphis, his fourth career 40-point game... Scored 26 second quarter points to become the first player since Kobe Bryant in 2005-06 with multiple 26-point quarters in a single season. •Scored 39 points on 2/22 at Indiana, hitting a career-high 10 free throws (10-of-10 FT), the most free throws he has made without a miss in his career. •Started the 2015 All-Star Game alongside teammate Stephen Curry to give the Warriors two All-Star starters for the first time in nearly 50 years (Rick Barry and Nate Thurmond started the 1967 All-Star Game at the Cow Palace in San Francisco)... Joined Curry to become the first pair of Warriors guards to start the All-Star Game and first backcourt tandem from the same team to start the annual showcase since New York’s Walt Frazier and Earl Monroe in 1975. •Scored 30-plus points in three-straight games (1/23-1/27) for the first time in his career. •Posted his first career 30/10 game with 30 points and a career-high-tying 10 rebounds on 1/27 vs. Chicago. •Named Western Conference Player of the Week for games played 1/19-1/25... In four games that week, averaged 33.0 points (second in the NBA), 3.5 assists, 2.5 rebounds and 2.25 steals in just 29.8 minutes, hitting 56.4 percent from the field and 55.3 percent from three-point range... Became the first player in Warriors franchise history to win three weekly accolades in the same season (previously earned the honor on 1/5-1/11 and 10/28-11/2). •Scored a career-high 52 points on 1/23 vs. Sacramento, setting an NBA record for points in a quarter with 37 points on a perfect 13-of-13 from the field and 9-of-9 from three-point range in the third frame, besting the previous record of 33 points set by George Gervin (4/9/78) and Carmelo Anthony (12/10/08) and topping Wilt Chamberlain’s franchise record of 31 points (set in the fourth quarter of his NBA-record 100-point game on 3/2/62)... Set an NBA record for threes in a quarter with nine, surpassing the previous record of eight set by Michael Redd (2/20/02) and Joe Johnson (12/16/13)... Hit both of his free throws in his perfect third quarter, scoring 37 of the team’s 41 points in the frame and giving him 50 points after three quarters... Finished the game with career highs of 16 field goals made (16-of-25 FG) and 11 three-pointers (11-of-15 3FG)... Became the 12th player in Warriors history to score 50 points in a game... Became the first player to score at least 50 points in fewer than 33 minutes since Kobe Bryant did so on 12/20/05. •Named Western Conference Player of the Week for games played 1/5-1/11, averaging a Western Conference-leading 27.7 points to go with 3.7 rebounds, 1.7 assists, 1.33 steals and 1.00 blocks in 29.3 minutes, hitting 51.9 percent from the field, 50.0 percent from three-point range and 93.3 percent from the free throw line. •Scored at least 20 points in a career-high eight consecutive games (12/2-12/16). •Scored in double figures in his first 56 games of the season (10/29-3/1), a career-best streak. •Named Western Conference Player of the Week for games played 10/28-11/2... Averaged a league-leading 29.7 points to go with 3.0 assists, 2.7 rebounds and 1.67 steals in 35.3 minutes, hitting 53.7 percent from the field, 45.5 percent from three-point range and 91.3 percent from the free throw line... Became the first Warrior to receive the award in the season’s opening week since Tim Hardaway in 1994. •Hit the go-ahead shot with 8.9 seconds remaining on 11/2 at Portland. •Scored 41 points in the home opener on 11/1 vs. the L.A. Lakers... Combined with his backcourt mate, Stephen Curry, to score 72 points on 24-of-37 (.649) shooting from the field, marking the first time the Warriors’ starting backcourt combined for at least that amount in a non-overtime contest since 4/14/10 at Portland, when Curry (42 points) and Monta Ellis (34) scored 76 points... Scored the most combined points ever by a starting backcourt on 37 or fewer attempts (since starters were first tracked in 1970-71). •Missed one game with a strained right hand, the first game missed due to injury in his career... Missed three games due to a right ankle sprain and one game due to rest. •Appeared in 21 postseason games (all starts), averaging 18.6 points, 3.9 rebounds and 2.6 assists in 36.2 minutes per game, shooting a playoff career-high 44.6 percent from the field to go with 80.0 percent from the free throw line. •Scored 20-plus points 11 times and 30-plus once. •Connected on a playoff career-high 14 field goals en route to scoring 34 points in Game 2 of the NBA Finals on 6/7 vs. Cleveland... Became the first Warrior since Rick Barry in 1975 to score at least 30 points in an NBA Finals game. •Became the 12th player in franchise history to tally 500 points for his postseason career in Game 6 of the Western Conference Semifinals on 5/15 at Memphis. •Scored 20-plus points in four-straight postseason games (every game of the First Round against New Orleans, 4/18-4/25). •Appeared in 81 games (all starts), averaging 18.4 points, 3.1 rebounds and 2.2 assists in 35.4 minutes, shooting 44.4 percent from the field and 41.7 percent from three-point range. •Among NBA leaders, ranked second in three-pointers (223) behind teammate Stephen Curry, making the duo the first pair of teammates ever to finish as the top two three-point leaders in a single season. •Became the first player in NBA history to hit at least 500 three-pointers through the first three years of his career and the seventh player in NBA history to hit 200 threes in consecutive seasons. •Scored 20-plus points 33 times and 30-plus five times. •Missed his first career game to attend his grandfather’s funeral, ending the second-longest active consecutive games played streak at 214 games from 12/25/11-3/12/14, which was the eighth-longest streak in Warriors history and longest to start a career in team history. •Hit the game-winning shot with 0.6 seconds left in a 98-96 win on 3/4 at Indiana. •Connected on a season-high eight three-pointers on 12/1 at Sacramento. •Recorded his first career double-double with 20 points and a career-high 10 rebounds on 11/27 at Dallas. •Scored a season-high 38 points in the season opener on 10/30 vs. the L.A. Lakers on 15-of-19 (.789) shooting from the field, becoming just the sixth Warrior in the team’s West Coast Era (since 1962-63) to score 38-plus points in a season opener (joining Wilt Chamberlain, Rick Barry, Chris Mullin, Latrell Sprewell and Monta Ellis)… In NBA history, joined Ellis (2010) and Kiki Vandeweghe (1984) as the only players to score at least 38 points while shooting 75 percent or better from the field in a season opener. •Appeared in seven postseason games (all starts), averaging 16.4 points, 3.6 assists, 3.4 rebounds and 1.00 steal in 36.7 minutes, shooting 40.8 percent from the field. •Finished the postseason with 41 career three-pointers, moving into second place on the franchise’s all-time postseason three-pointers list. •Scored 20-plus points three times. •Dished out a playoff career-high seven assists in Game 7 of the First Round on 5/3 at the L.A. Clippers. •Scored a 2014 postseason-high 26 points in Game 3 of the First Round on 4/24 vs. the L.A. Clippers, grabbing six rebounds in 42 minutes. •Appeared in a career-high 82 games (all starts), averaging 16.6 points, 3.7 rebounds, 2.2 assists and 1.05 steals in a career-high 35.8 minutes, shooting 42.2 percent from the field, 40.1 percent from three-point range and 84.1 percent from the free throw line. •Became one of only two players from the 2011 NBA Draft to play in all 148 possible regular-season games dating back to 2011-12 (Kemba Walker). •Among second-year players, finished second in scoring and three-point percentage. •Together with Stephen Curry, combined for 483 three-pointers to become the second pair of teammates to both hit 200-plus threes in a season (joining Boston’s Antoine Walker and Paul Pierce in 2001-02). •Scored 20-plus points 30 times and 30-plus twice. •Tallied 11 points in 14 minutes off the bench for Team SHAQ in the BBVA Rising Stars Challenge at NBA All-Star Weekend in Houston. •Logged a career-high 55 minutes on 11/10 vs. Denver, becoming the first Warrior to play 50-plus minutes since Monta Ellis on 3/11/11 vs. Orlando (53). •Appeared in 12 postseason games (all starts), averaging 15.2 points, a playoff career-high 4.6 rebounds, 1.8 assists and 1.00 steal in a playoff career-high 41.3 minutes, shooting 43.7 percent from the field, 42.4 percent from three-point range and 83.3 percent from the free throw line. •Led the team in three-point field goal percentage during the postseason, hitting 42.4 percent from distance (25-of-59 3FG). •Scored 20-plus points three times and 30-plus once. •Logged a postseason career-high 51 minutes in Game 4 of the Western Conference Semifinals on 5/12 vs. San Antonio, finishing with 10 points and a playoff career-high-tying three steals. •Tallied 34 points, his first career 30-point postseason game, and grabbed a postseason career-high 14 rebounds in Game 2 of the Western Conference Semifinals on 5/8 at San Antonio, joining Michael Jordan, Kobe Bryant and Vince Carter as the only guards to reach those point/rebound figures in a game in the last 25 years. •Made his NBA Playoff debut in Game 1 of the First Round on 4/20 at Denver, scoring 22 points and grabbing three rebounds in 41 minutes. •Was the only Warrior to have appeared (and started) in all 94 of the team’s regular-season and postseason games. •Appeared in all 66 games (29 starts), averaging 12.5 points, 2.4 rebounds and 2.0 assists in 24.4 minutes, shooting 44.3 percent from the field, 41.4 percent from three-point range and 86.8 percent from the free throw line. •In 29 starts, averaged 18.1 points, 3.2 rebounds, 3.0 assists and 1.10 steals in 33.9 minutes. •Earned First Team All-Rookie honors. •Led all rookies in three-point percentage (17th in the NBA) and three-point field goals made (111), the first Warrior to do so since teammate Stephen Curry in 2009-10... Finished second among rookies in free throw percentage and fourth in scoring. •Was the only Warrior to appear in all 66 games and one of only six rookies to do so in the NBA. •Led all rookies in scoring in the month of April with 18.6 points, 3.8 rebounds and 2.8 assists in 16 games, shooting 45.9 percent from the field. •Became one of only three rookies (qualified for the three-point percentage leaderboard) in NBA history to hit at least 44.0 percent from the field, 41.0 from three-point range and 86.0 percent from the free throw line (Stephen Curry in 2009-10 and Anthony Morrow in 2008-09, both with the Warriors)... Became one of only five players to hit those percentages in 2011-12 (Ray Allen, Jordan Farmar, Manu Ginobili, Ben Gordon). •Had two games with at least 25 points, five rebounds and five assists, one of two rookies to record multiple 25/5/5 games (Kyrie Irving). •One of five rookies in the starting lineup for the Warriors in the season finale on 4/26 vs. San Antonio, the first time that an NBA team started five first-year players (since starters were first tracked in 1970-71). •In a six-game stretch from 4/12-4/21, averaged 24.0 points, 5.0 rebounds, 4.5 assists and 1.83 steals in 43.5 minutes, shooting 47.1 percent from the field (42.9 percent from distance) and scoring 24-plus points in five of those six contests. •Scored 31 points on 3/24 vs. Sacramento, the second most points by a rookie in 2011-12 (Kyrie Irving, 32). •Hit 29 consecutive free throws from 3/11-3/28. •Made his NBA debut on 12/25 vs. the L.A. Clippers, scoring seven points in 19 minutes. •Won an Olympic gold medal with Team USA at the 2016 Olympic Games in Rio de Janeiro... Averaged 9.9 points in 21.1 minutes over eight games (six starts) during Team USA’s perfect 8-0 run through the tournament. •Won a gold medal as a member of Team USA at the 2014 FIBA Basketball World Cup in Spain... Finished as the team’s second-leading scorer, averaging 12.7 points, 2.2 rebounds, 2.1 assists and 1.00 steal over nine games. •One of 27 players invited to participate in the 2013 USA Basketball Men’s National Team mini-camp in Las Vegas. •Member of 2012 USA Select Team. •Won a gold medal at the 2009 U-19 World Championship in New Zealand, averaging 7.8 points and 4.4 rebounds in nine games while shooting 51.6 percent from three-point range. •Appeared in 98 games (96 starts) over three seasons at Washington State, averaging 17.9 points, 4.8 rebounds and 2.6 assists in 34.4 minutes. •Left Washington State ranked first all-time in school history in three-pointers (242), third in points (1,756), third in scoring average (17.9), fourth in free throw percentage (.827), 10th in three-point percentage (.390) and 10th in steals (130). •Named to the All-Pac-10 Conference First Team as a junior and sophomore. •As a junior, appeared in 34 games (33 starts), averaging 21.6 points (1st in Pac-10), 5.2 rebounds, 3.7 assists and 1.65 steals in 34.7 minutes. •Ranked 11th in the nation in scoring, while leading the team and conference in three-pointers with 98. •As a sophomore, appeared in 31 games (30 starts), averaging 19.6 points, 5.1 rebounds, 2.3 assists and 1.42 steals in 35.4 minutes. •Led the Cougars to the Great Alaska Shootout Championship by scoring a tournament single-game record 43 points. •As a freshman, appeared in 33 games (all starts), averaging 12.5 points, 4.2 rebounds and 1.9 assists in 33.1 minutes... Named to the Pac-10 All-Freshman Team. PERSONAL: Full name is Klay Alexander Thompson... Father, Mychal, was the No. 1 overall pick in the 1978 NBA Draft by the Portland Trail Blazers and played 12 seasons in the NBA, winning two NBA Championships with the Los Angeles Lakers... 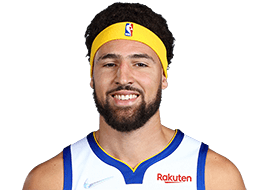 Older brother, Mychel, appeared in five games with the Cleveland Cavaliers in 2011-12 and played for the Santa Cruz Warriors, Golden State’s NBA Development League affiliate, for four seasons (2013-14 through 2016-17)... Younger brother, Trayce, was selected in the second round of the 2009 Major League Baseball Draft by the Chicago White Sox and currently plays outfield with the Los Angeles Dodgers... Mother, Julie, played volleyball at the University of San Francisco... His #1 was retired by his alma mater, Santa Margarita Catholic High School, in a ceremony on campus in January 2017... Served as the Grand Marshal of the GoPro Grand Prix of Sonoma Verizon IndyCar Series season finale at Sonoma Raceway on Sept. 17, 2017; Gave the official command of, “Drivers, Start Your Engines,” waved the green flag and took a high-speed lap around the road course with racing legend Mario Andretti in a two-seat Indy car... Family was honored in the Bahamas in the summer of 2015, including a welcome reception hosted by the government of the Bahamas in Nassau and the commissioning of Mychal “Sweet Bells” Thompson Boulevard in honor of his father... Has been extremely active with Warriors community outreach programs... Donated $25,000 to KIPP Bay Area schools in September 2015... Earned the Alvin Attles Community Impact Award in April 2015 in recognition of his efforts to make a positive impact on the lives of underserved youth in the Bay Area... The Warriors Community Foundation donated $15,000 in his honor to the Good Tidings Foundation in recognition of his community work... Received the NBA Cares Community Assist Award for November 2014, with the NBA donating $10,000 on Thompson’s behalf to the Good Tidings Foundation... Donated $20,000 to the city of Oakland in 2014 to help fund the city-wide Thanksgiving Dinner event, which served 2,000 families... Took part in the Back to School in the Bay: Clorox Clean Up the Classroom event prior to the 2013-14 campaign... Also participated in the Splash Brothers Parent-Child Fantasy Basketball Clinic at the Warriors practice facility, where kids received one-on-one instruction from Thompson, teammate Stephen Curry and their respective fathers, Mychal Thompson and Dell Curry... In 2012-13, teamed up with local children’s charity Good Tidings Foundation to provide the Eastside College Preparatory School Girls Basketball Team with food and equipment during the holiday season, picking the students up in a limo and taking them shopping for Thanksgiving dinner supplies and a surprise trip to Sports Authority for a new pair of basketball shoes for the season... Also took part in the Make-A-Wish Holiday Party at the team’s practice facility, in which several Make-A-Wish families were treated to an evening of carnival-type games... Has attended several sessions of Warriors Basketball Camp and participated in numerous meet and greets with Warriors fans, Season Ticket Holders, corporate partners and community organizations... Has participated in the Oracle Basketball Clinic and the Hoops and Health Clinic presented by Kaiser Permanente... Purchases tickets to every home game that are donated to deserving youth groups... As a senior in 2007-08 at Santa Margarita, earned Division III State Player of the Year honors, leading the Eagles to a 30-5 record and the Division III State Championship... Scored 37 points in the state title game, connecting on a state finals record seven three-pointers.